Ahh...it's so much easier to keep up with my reviews during summer, when many of my books are longer ones for my Big Book Summer Challenge, which means fewer reviews to write! I finished just five books in July, but they were all excellent, and two of them were Big Books (more than 400 pages) for my Big Book Summer Challenge. My favorite? Impossible to choose! I absolutely loved every page (or minute) of Dragonfly in Amber (#2 in the Outlander series), Great Expectations, and Afterworlds. Of the five books I read, four were adult fiction and one was YA, and two were on audio. 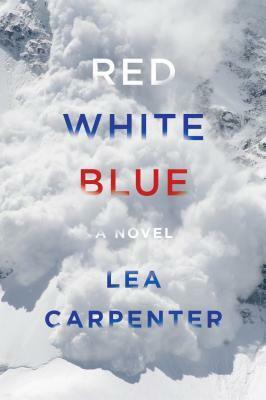 I'll share the link to my review of Red, White, Blue once it is published on Shelf Awareness. This is my favorite part of my monthly summary - updating my Reading Challenges! I read 3 books from my own shelves for my Mount TBR Reading Challenge, bringing my total-to-date to 14. I can always rely on my Big Book Summer Challenge to boost my TBR numbers! 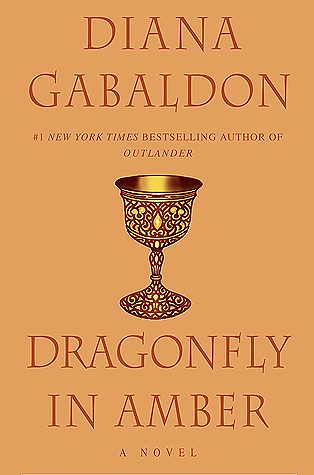 For the Monthly Motif Reading Challenge, July was Vacation Reads so I chose Dragonfly in Amber. 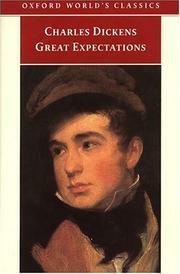 I added Great Expectations for the Back to the Classics Challenge, bringing my total for the year so far to 3! That also counted for the 2018 Badass Books Challenge: a book published more than 100 years ago. I added France & Scotland to my Travel the World in Books Reading Challenge. 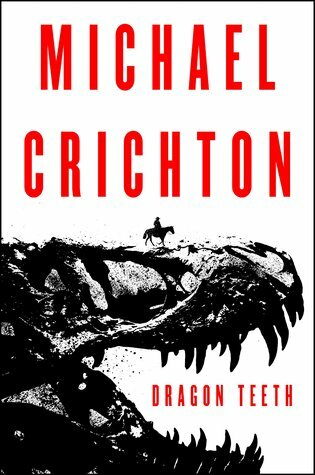 For my 2018 Literary Escapes Challenge, I added just one new state but it was a rare one for book settings - Montana (Dragon Teeth). And for my own Big Book Summer Challenge, I finished my second Big Book for 2018 - Dragonfly in Amber (and am now reading my 3rd one). There is still plenty of time to join the summer fun - click the link for details! 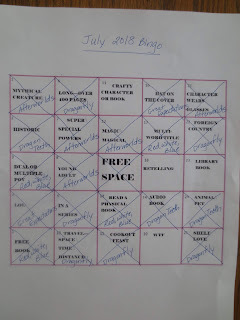 Finally, Bookish Bingo hosted by Chapter Break - not really a challenge per se, but a fun game that I play each month. 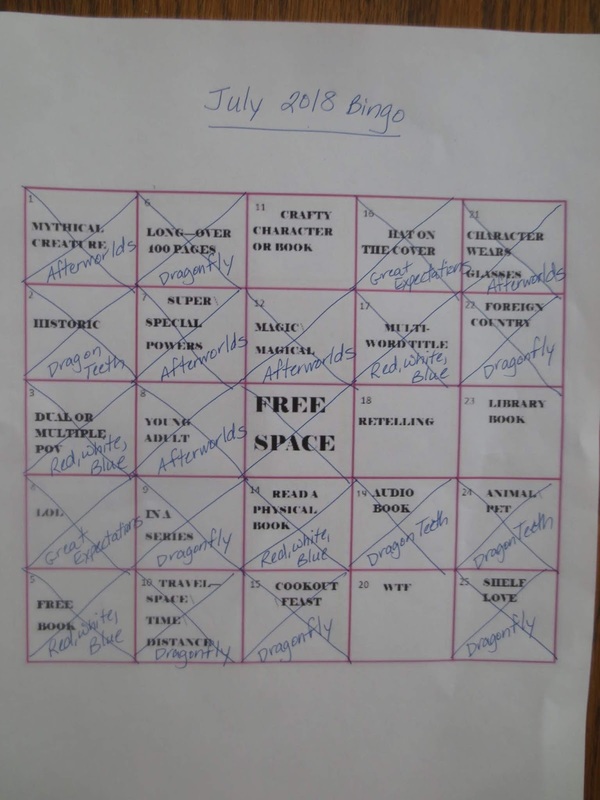 I filled in 21 squares in July - a good Bingo month for me! What was your favorite book read in July? Indeed a very good month and nothing better than getting stuck into a long book. Especially one like Dragonfly in Amber. Enjoy Outsider - I've heard it's great! 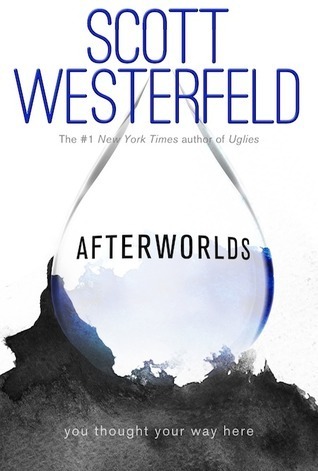 That book Afterworlds sounds right up my alley! 21 squares that's wonderful reading! Dragonfly In Amber should count as two or three books! Hope you are continuing on with the series. It's Monday 8/27! What Are You Reading? It's Monday 8/20! What Are You Reading? Summertime...and the Reading is Easy! It's Monday 8/6! What Are You Reading?